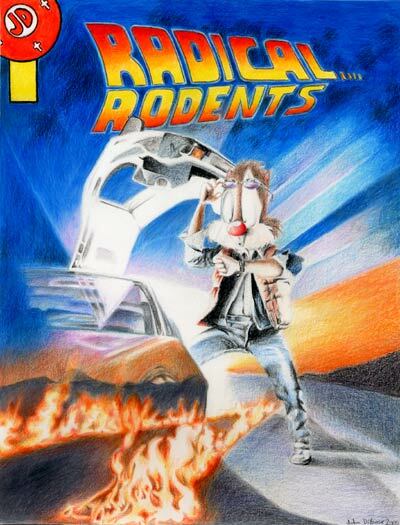 I started my own personal comic book series in 1994 about 4 chipmunks and a guinea pig in a Christian band called Radical Rodents. Since then I’ve done several parodies and spoofs as issues and lately, I’ve just spent the time and have done merely the covers. This was the first– a spoof on one of my favorite movies, Back to the Future. It was done in all colored pencil, recreating the movie poster as exact as I could while placing Lloyd the chipmunk in replace of Michael J. Fox.